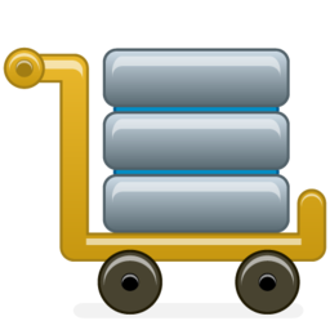 The complete and easy to use command-line migration tool for PostgreSQL. Install this globally and you'll have access to the pg-migrator command anywhere on your system. The quickest way to migrate the target database with pg-migrator is type "pg-migrator" and a valid connection string as shown below. 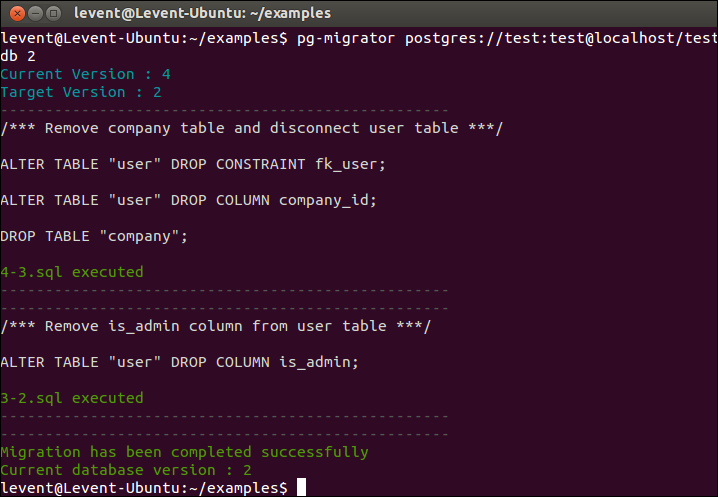 This command will migrate the "testdb" database to the latest version according to migration scripts. You can also chose the target version with a second parameter as shown below. This command will migrate the "testdb" database to version 15 (forward or backward according to current database version). Other avaliable version options are shown below. pg-migrator uses migration scripts in current execution folder or subfolders. All migration script files must have an extension with ".sql" (case insensitive) and "x-y.sql" format that x and y must be valid numbers. Both numbers also must be sequential. All other files will be ignored. 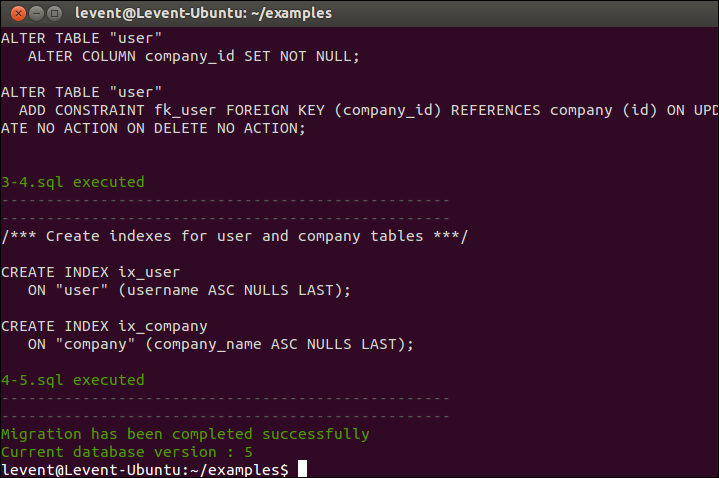 Migration scripts can contain any valid sql statements like create/alter table and also insert/update data etc. You can categorize your scripts with folders as you wish. pg-migrator search all subfolders and put them in order according to x-y numbers in file names, independent of folder structure. Let's say, our database is in version 25 at the moment. If you request one step forward migration, pg-migrator searches folders for a file with "25-26.sql" name and if can't found, displays an error message. Likewise, if you request one step backward migration, at this time, pg-migrator searches folders for a file with "25-24.sql" name and if can't found, displays an error message. So, your migration scripts must be started from "1-2.sql" and go on like "2-3.sql", "3-4.sql" etc. For backward migration, you must also have files like "2-1.sql" and go on like "3-2.sql", "4-3.sql" etc. Let's go step by step from the scratch. You can find all migration scripts we will use during this example in the "examples" folder on Github. As a first step, we need a database. Let's create a new one with "testdb" name. At the moment, there is no table in it. 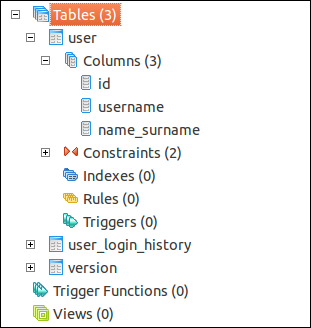 As a beginning to development, we need two tables, "user" and "user_login_history". Let's write some script to create them but don't execute it yet. We'll use pg-migrator for execution. With this script, we are creating two tables and insert some data to them. Let's save this script as "1-2.sql". When this script executed, our database will be migrated from version 1 to version 2 (Forward migration). Ok, that was the first one and we need an opposite script in case of roll back this operation. This script can be written like below. That was quite easy, just deleted all the tables. We'll save this script as "2-1.sql". When this script executed, our database will be migrated from version 2 to version 1 (Backward migration). Ok, let's continue to development. 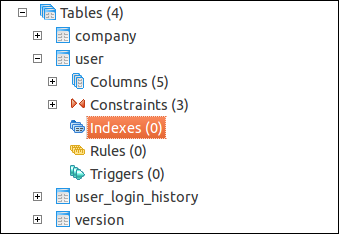 At this time, we need to add a new column to user table with "is_admin" name so write the script below and save it as "2-3.sql". Why don't we just add a new column with NOT NULL keyword directly? Because between two versions, some data may be inserted into the table so we can't create a new column with NOT NULL property. So, we've created a new column with NULL property, update all posible data to a default value then alter the column with NOT NULL property (Of course, you can define a default value for the new column but this property will stay on the column. This way is much more reasonable for production). We need a roll back script again. Let's save the script below as "3-2.sql". This will just drop the newly inserted column. Continue to development. We need a new table with "company" name and connect it with existing "user" table. So write the script below and save it as "3-4.sql". We have just created a new table, inserted some data in it. 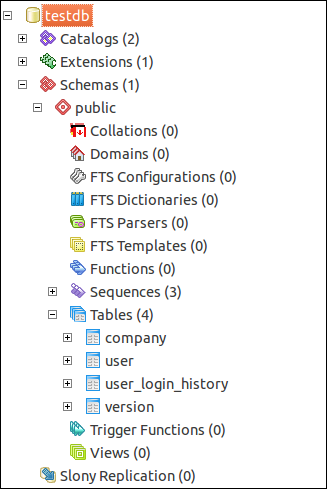 Added a new column to the "user" table and connected it to the new table with a foreign key. Let's write a roll back script and save as "4-3.sql". 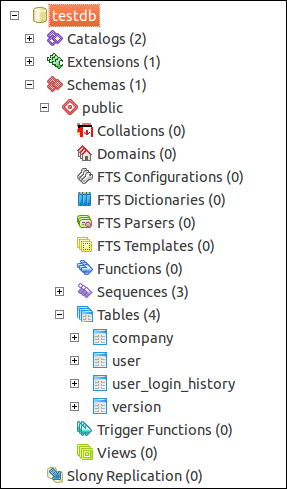 We have just deleted foreign key, newly added column and the table. Before start the show, we will create a couple of script. This time for performance tuning. Let's create a few index with the following script (4-5.sql). And the roll back script (5-4.sql). That all. We can start to use pg-migrator now. Because pg-migrator can seek and execute migration script in any subfolders, we are free to organize script files as we wish, so I will categorize scripts with folders like below. I have created some script files in "ignored-files" folder. All files in this folder will be ignored by pg-migrator because of "x-y.sql" naming standard. Let's open a terminal, go into the scripts' root folder and type the following command (I have a db user with "test" username and "test" password). What's happend? 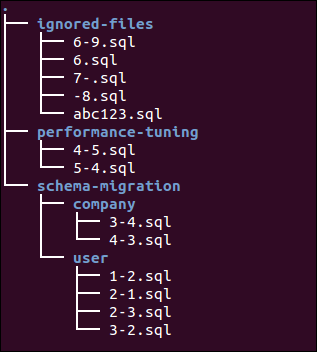 All scripts are executed by pg-migrator with "1-2.sql" -> "2-3.sql" -> "3-4.sql" -> "4-5.sql" order. At the moment, db should seem like below. All tables and indexes have been created and data inserted. 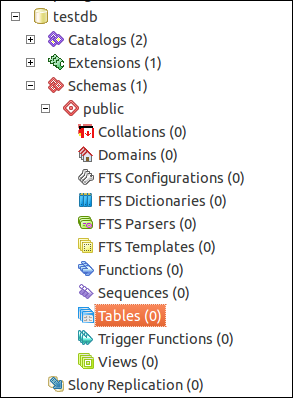 Did you realized a new table with "version" name? This table belongs to pg-migrator and used to track current db version. There are some other migration tools that track the current db version in some files but this is not reasonable actually. Because these files can easy be deleted or go out of sync with DB. What about if you have multiple servers? I'm strongly recommend track the current version in db because it is the only secure place against out of sync. Ok, db on version 5 at the moment. But we decided to remove indexes so roll one version back. We can use following command for this task. 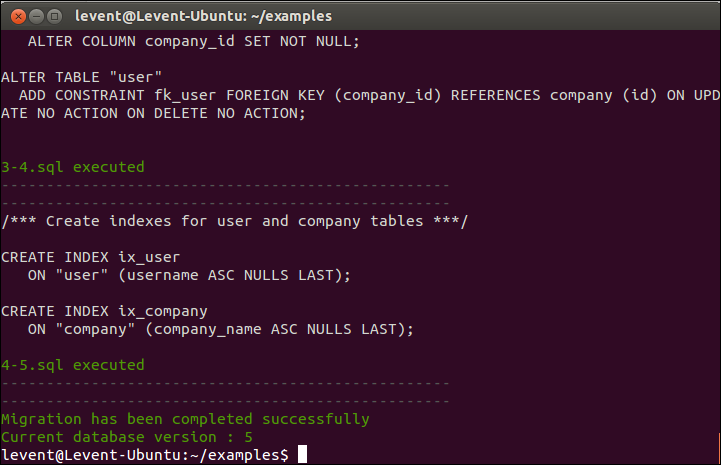 pg-migrator finds and executes "5-4.sql" script and roll back db to version 4. At this time, we decided to move db to version 2. We can use following command for this task. pg-migrator finds and executes "4-3.sql" and then "3-2.sql" scripts and roll back db to version 2. Not bad ha, what's next? Let's go to one step forward with the following command. 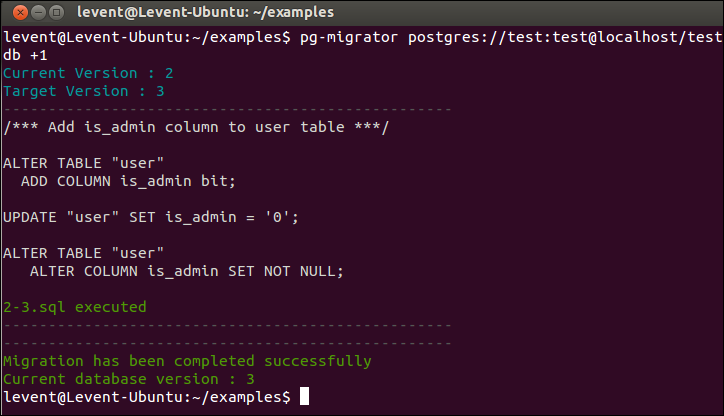 pg-migrator finds and executes "2-3.sql" and migrate db to version 3. Ok, that's enough. let's return to the latest version with the following command. pg-migrator finds and executes "3-4.sql" and then "4-5.sql" scripts and migrates db to version 5. Fire at will! You can take a stroll between db versions with pg-migrator. pg-migrator must be executed in the root of migration scripts folder. It will search all directory content and all subfolders content recursively. Migration script files must be in "x-y.sql" format that x and y must be valid numbers. Both numbers also must be sequential. All other files will be ignored. All script files also must be sequential like "1-2.sql" and "2-3.sql" .There must not be hole between files (Like "1-2.sql" and "3-4.sql"). All migration scripts are executed in the same transaction scope and totally roll back in case of fail so you shouldn't put any transaction statements in your scripts. You should use a db user with sufficient permissions according to your script content.